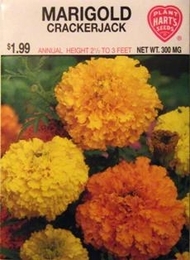 Crackerjack is a large giant flowered type measuring 4 -5 inches across with full Marigold color range of yellow, gold and orange. Blooms are carried on long stems, in full view, making them ideal for both bedding and cut flowers. Thinning - when plants are 3-5 inches tall thin to 12 inches apart.